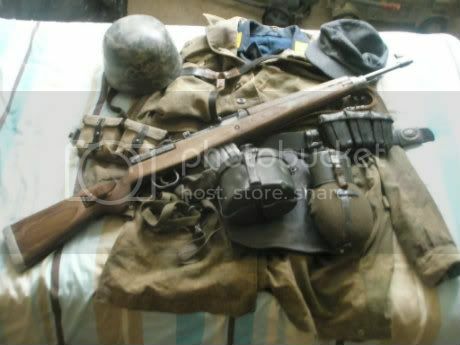 Hi I have a bit of Fj kit and wondered if late war say during the Battle of the Bulge could paras wear Army issue ankle boots , and with or without gaiters .Also black or brown leather could I get away with black belt , one K98 pouch . Only asking I'm on a tight budget at the mo and have ankle boots. Also para Y strap colours ? Thanks mate , I was going to do Normandy but the boot issue put me of plus wanted to take my G43 (home made) . I only have the standard FJ uniform , splinter and tan / water smock's . I do have the balaclava thing (sorry don't know proper name) I was going along the lines of the FJ on the back of the Kingtiger seen in the picts during the Battle of the Bulge . can you elaborate on the homemade G43? why winter gear? the tankriders wore their bonesack... Ok I would wear an undershirt and a pullover extra, but reversable wintergear no. I meant any kind of kit that might keep you warm in your Wolfgrabhüle really. Pullover, greatcoat, turtleneck from Mutti, gloves, scarf...The occasional reversible parka as well though right? Hi all thanks dfor the imput.